Mohamed Bin Issa Al Jaber - Who is Mohamed Al Jaber? Who is Mohamed Al Jaber? Mohamed Bin Issa Al Jaber is a self-made businessman, philanthropist and UNESCO Special Envoy for Education, Tolerance, and Cultures in the Middle East and UN Spokesperson for Global Forums on Reinventing Government. 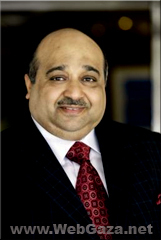 MBI Al Jaber is founder, Chairman & CEO of MBI International, a hotel and resort, real estate development, oil & gas and agro-industries conglomerate, with a group net asset value in excess of $9 billion operating across Europe, the Middle East and the United States. Mohamed Bin Issa Al Jaber has acted as a bridge between the West and the Middle East, educating the West about the region while providing students in the Middle East a chance for higher education in the UK and Europe. As early as the mid-90s, MBI Al Jaber recognised the need for the existence of a high-profile international forum for the study of the Middle East in order to promote understanding and to counteract negative perceptions and stereotyping. He envisaged a centre of expertise and resources for academics as well as for business and government, the media and NGOs. Towards that aim, he founded the MBI Trust in London and subsequently endowed the MBI Al Jaber Chair in Middle Eastern Studies at the SOAS, University of London. He was founding patron in 2000 of the London Middle East Institute at SOAS, a premier think-tank on the Middle East directed by the MBI Al Jaber Chair. In 2002, MBI Al Jaber was awarded an Honorary Fellowship at SOAS in recognition of his contribution to scholarship and progress in theArab world. MBI Al Jaber is founder, sole patron and Chairman of the MBI Al Jaber Foundation, which has provided an opportunity for hundreds of promising undergraduates in the Middle East and North Africa to continue their education in top universities in Europe and the rest of the world. One of the aims of the scholarship programme is to enable students to experience and appreciate other cultures and later share this newfound knowledge with their communities at home. In recognition of this work, MBI Al Jaber was awarded a Doctorate of Letters from University of Westminster in 2004.
with MODUL University in Vienna; the MBI Al Jaber Foundation now grants 35 scholarships to students from the Arab world each year. Through the MBI Al Jaber Foundation, MBI Al Jaber also supports universities. In 2007, the MBI Al Jaber Building at Corpus Christi College Oxford and the Mohamed Bin Issa Al Jaber Lecture Theatre at the UCL Institute for Cultural Heritage were named in honour of his generosity and support. A second aim of the scholarship programme is to promote leadership and public service skills in young Arabs. MBI Al Jaber Foundation alumni are making their own contributions to the region and many of them have gone on to become influential within their countries of origin through important posts in state and civil institutions, the United Nations, NGOs and other leading organisations. Another facet of MBI Al Jaber’s involvement in the region is his interest in furthering education for women in the Arab World. MBI Al Jaber believes that education reform includes the promotion of women’s rights in the Middle East so that women can be major contributors to a lasting peace and a better future. This commitment has led to his generous support of a number of projects including a major donation to Dar El Hekmah Private College for Women in Jeddah, Saudi Arabia, which greatly expanded the campus of the College and provided new academic and social facilities for faculty and students. The first class of graduates from the College was granted MBI Al Jaber Foundation scholarships enabling several female students to come to London to earn their Master's degrees. MBI Al Jaber is adding further support to this initiative by granting scholarships to students at the all-girls Effat College in Jeddah, Saudi Arabia. As part of his vision of achieving better mutual understanding through education, MBI Al Jaber seizes every opportunity to share his vision of the Arab world with the West. MBI Al Jaber’s dedication to the promotion of education has inspired him to share his knowledge and perspective as a businessman from the region in seminars, lectures and conferences focusing on peace, tolerance, governance and sustainable development in the broader Middle East/North Africa. MBI Al Jaber has led interactive seminars with students at the Johns Hopkins School of Advanced International Studies in Washington D.C., the University College of London in the UK and Sciences Po and Nice University in France. He also meets regularly with the policy community in the US, UK, France, Austria, Switzerland and elsewhere to offer a Middle East perspective on public service, governance and policy issues. In New York, he launched the MBI Al Jaber Roundtable on Critical Issues in the Middle East at the Council on Foreign Relations in 2005. MBIAl Jaber continues to demonstrate his commitment to public service, regional reform and good governance by providing a forum to help the policy community gain a clearer understanding of the region. In 2008, Mr. Hans-Gert Pottering, President of the European Parliament invited MBI Al Jaber to Strasbourg to laud his efforts towards the advancement of education and support of projects aimed at building bridges between Europe and the Middle East. MBI Al Jaber hopes that through education reform, greater cross cultural understanding will emerge between people from the region and the West, and within the region itself. In 2003, MBI Al Jaber entered into a series of agreements with the Director-General of UNESCO in Paris to promote education reform in the Arab world. These agreements include free inserts of books on modern literature and social sciences, as well as the Arabisation of internet domain names to provide greater access to the internet for Arabic speakers. The partnership also envisages ambitious projects for curriculum change and teacher training. Noticing the lack of advances in education in many Arab countries, MBI Al Jaber feels strongly that school curriculum and teacher training need to compete better alongside their counterparts in the West. His support has resulted in the inclusion of education reform on the Agenda of the Arab League summit in Khartoum and its endorsement and approval at the summit in Riyadh. In 2005, MBI Al Jaber was nominated by the Director-General of UNESCO to become UNESCO Special Envoy for Education, Tolerance, and Cultures in the Middle East.MBIAl Jaber has also earned recognition and acknowledgement from governments for the work he has done towards education reform. In 2007, H.E. Dr. Al Mounji Bousnina Director General of ALECSO, the Arab League Educational, Cultural and Scientific Organisation, awarded MBI Al Jaber the Gold Medal, the organisation’s highest honour, as a sign of gratitude for his strong support of projects aimed at education reform in the Arab World. governments in the Middle East and North Africa catch up with modern techniques of knowledge management and e-government beginning with a pilot project in Mauritania, Algeria and Yemen. By uniting the resources of the private sector with the interests of the public sector, MBI Al Jaber has created powerful partnerships for change. For his dedication to governance and public service and his commitment to the promotion of public and private partnership, Ms. Asha-Rose Migiro, Deputy Secretary-General of the United Nations, appointed MBI Al Jaber the UN Spokesperson for Global Forums on Reinventing Government in 2007.
business acumen and philanthropy with the award of an honorary degree of Doctor of Science. and democracy in the Middle East by the Trialog Institut, an interfaith and intercultural organisation. MBI Al Jaber was named Chairman of the Mediterranean Peace Forum at its first session held in Lecce, Italy in November of 2008. The Forum promotes dialogue, peace and cooperation among the people of the three continents of the Mediterranean region. MBI Al Jaber’s overriding motive is not personal gain (for in fact his views have often been held in the face of personal and financial sacrifice) nor recognition (though he has received many honorary degrees and awards). Through a multifaceted regional approach, which includes scholarships and training for young people, partnership with leading UN agencies, funding premier institutes, curriculum change and promoting women’s education, MBI Al Jaber demonstrates strong and sustained commitment to education, tolerance and peace in the Middle East.